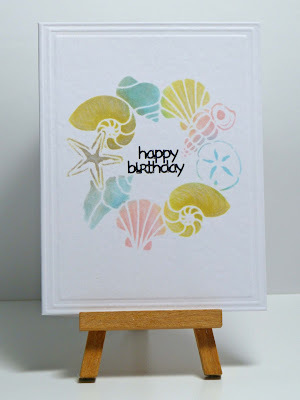 Cathy's Card Spot: Stencilled one layer shells. 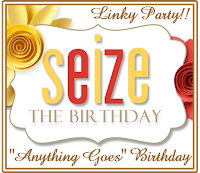 Hi everyone, I'm back with another card as party guest at Seize the Birthday. I've gone with the toppings option this time, one layer. But you can always play along with anything goes birthday. I very rarely make one layer cards, it's way out of my comfort zone lol! I wanted to try something other than stamping so I used a sponge dauber to add distress ink with this stencil, then added some white prismacolor pencil to try and give some shading. Not sure if I'm totally happy with my efforts, but I had fun trying this! I'm also linking up to the 3rd birthday celebrations at AAA Cards, congratulations! The shell wreath looks awesome and I love you used more natural colors to stencil!!! A beautiful birthday card! Beautiful card Cathy, those shells look really wonderful. Will have to keep my eyes open for that stencil, very very pretty, have worked perfectly. Absolutely beautiful, Cathy! The shells and the colors look splendid! Love it! Oh what gorgeous stencilling! A wreath of shells is such a novel idea and your colours are just perfect for a seaside theme. Thanks for joining in with AAA Cards 3rd birthday celebrations. I really like this - the softness of the images is so unexpected. The embossing is a classy addition too. It looks fabulous Cathy, the embossing really takes a one layer card to the next level. I love the soft look and the soft colors on this card. Well, considering it was out of your comfort zone, Cathy, you've done a marvellous job! Love the soft colours, and the embossed frame. You should be very happy with your efforts Cathy! Your perseverance paid off! I love it! This is exceptional!! I love the soft colors you used and your "wreath" design!! Beautifully done. We are so happy to have you with us as a special guest at STB!! 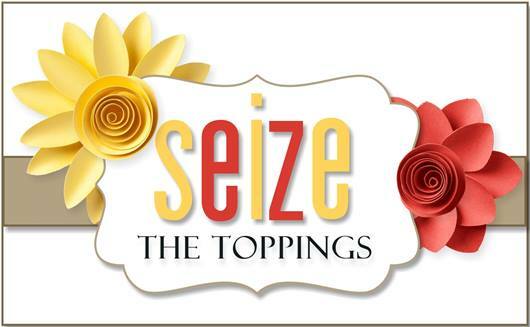 Wonderful job of stenciling, Cathy! Love the layout and colors! Love your card Cathy. You did a great job stenciling those images. This is fantastic. Love the ocean theme. You rocked this one layer card. Experimenting with brushos & texture paste.